At the invitation of President Xi Jinping, Emir of the State of Kuwait Sabah Al-Ahmed Al-Jaber Al-Sabah will pay a state visit to China from July 7 to 10 and attend the opening ceremony of the 8th Ministerial Meeting of the China-Arab States Cooperation Forum in Beijing. During the visit, President Xi Jinping will hold the welcoming ceremony and banquet for Emir Sabah Al-Ahmed Al-Jaber Al-Sabah. The two heads of state will hold talks and attend the signing ceremony of cooperation documents. Besides, President Xi Jinping and Emir Sabah Al-Ahmed Al-Jaber Al-Sabah will attend the opening ceremony of the 8th Ministerial Meeting of the China-Arab States Cooperation Forum in Beijing on July 10. Kuwait is one of the first Gulf States to establish diplomatic relations with China. In recent years, China-Kuwait relations have been developing rapidly. Our two countries have lent mutual understanding and support to each other on issues concerning each other's core interests and major concerns. Kuwait is also one of the first countries to ink the cooperation document on the Belt and Road Initiative with China. Remarkable achievements have been reaped in our cooperation covering such areas as energy, trade, investment, financing and infrastructure building. There are vibrant cultural and people-to-people exchanges between our two sides. Emir Sabah Al-Ahmed Al-Jaber Al-Sabah's upcoming state visit to China is his another visit to China after a lapse of nine years. 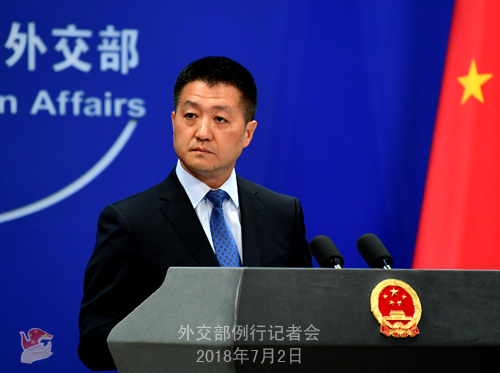 China hopes that our two sides, through this important visit, can further cement traditional friendship, enhance political mutual trust, deepen our cooperation across the board under the framework of the Belt and Road Initiative and elevate China-Kuwait ties to a new level. Kuwait is an active participator of the China-Arab States Cooperation Forum. We believe that this visit is of great significance to elevating the level of China's cooperation with the Arab States as a whole under the new circumstances. Q: We have noted that recently the DPRK and the ROK have continued with their positive interactions. The two sides held the general-level military talks with the aim of easing the military tensions. They agreed to resume the reunion activities of separated families at the DPRK's Kumgang Mountain in August and field a joint team to attend the 18th Asian Games in Indonesia next month. They have reopened the maritime communication channel which was interrupted ten years ago. What is your comment? A: We are truly gratified to see that recently the DPRK and the ROK have conducted positive contacts and interactions in many fields and achieved more and more consensus and outcomes. Under the current circumstances, the DPRK and the ROK following the spirit of the Panmunjom Declaration, earnestly implementing the consensus by their leaders at the two summits and continuously promoting reconciliation and cooperation are conducive to cementing their mutual trust and improving their relations, and will play a positive role in sustaining and consolidating the momentum for detente on the Korean Peninsula. China always supports the DPRK and the ROK in improving their relations. We also hope that the international community can root for the two sides and play a constructive role in sustaining the momentum for dialogue, advancing the denuclearization of the Korean Peninsula and moving forward the political settlement process of the Korean Peninsula issue. Q: Mount Agung on the Bali Island erupted again on the night of June 27, shutting down the Ngurah Rai International Airport on June 29 and affecting 446 flights and over 70,000 travelers. How serious is the situation at this point? How many Chinese tourists have been stranded? Are there any measures taken by the Chinese authorities to effectively deal with that? Do you have any advice for the Chinese who have plans for going there? A: I will address what everyone wants to know first. According to my information at hand at this point, no Chinese tourist has been stranded on the Bali Island because of the eruption of Mount Agung. On June 29 local time, the Ngurah Rai International Airport was temporarily shut down for nearly 12 hours due to Mount Agung's eruption. The Chinese Foreign Ministry and the Consulate General in Denpasar attach high importance to this and have launched the emergency mechanism without delay. We have kept releasing information on the closing and opening of the airport in a timely manner through the consular service website of the Foreign Ministry (cs.mfa.gov.cn), the "China Consular Affairs" account on WeChat (Ls12308) and on Weibo, as well as the website and WeChat account of the Consulate General in Denpasar, to warn Chinese tourists against going to anywhere near the volcano. The Consulate General has stayed in close communication with relevant airliners and travel agencies to offer concrete assistance to Chinese tourists. As the alert on the volcanic eruption by the local government remains in place, Chinese tourists planning to go to the Bali Island in the near term are advised to stay tuned to relevant information, properly arrange for their schedule and pay close attention to their own safety. Q: Firstly, after last month's DPRK-US summit, the DPRK said that it would move towards the goal of denuclearization. However, the latest satellite imagery shows that it is still making progress in the manufacturing technologies of the ballistic missile and other relevant facilities, which has aroused concern from some US officials and the relevant personnel. What is your comment? Secondly, reports said that the Vice Minister of External Economic Affairs of the DPRK has arrived in Beijing for a visit. Can you offer us relevant information? A: I will take your second question first. China and the DPRK are friendly neighbors and our two sides maintain normal exchanges at all levels and in various areas. As to the specifics you mentioned, I have no information to offer to you. With regard to the first question, recently, the situation on the Korean Peninsula has taken a favorable turn. A positive momentum is building as the relevant parties are committed to advancing the denuclearization of the Korean Peninsula through dialogue and properly addressing their legitimate concerns. As to the specifics you mentioned, I don't know where they come from, or on what basis those US officials made the relevant comments. I think you may have to seek clarification from them. As far as China is concerned, since the DPRK-US summit in Singapore on June 12, both sides have said that they would actively stay committed to following through on the consensus reached by the two leaders. We hope that all relevant parties can make constructive efforts to implement the consensus in a smooth way, sustain the momentum for detente and dialogue on the Korean Peninsula and advance the denuclearization process of the Korean Peninsula instead of doing the opposite. Q: According to the reports this morning, Andrés Manuel López Obrador, candidate from the National Regeneration Movement (MORENA) party, has won the Mexican presidential election. What is your comment? A: As a good friend and good partner of Mexico, China warmly congratulates Mr. López on his election as the President of Mexico. We believe that under his leadership, Mexico will score new achievements in its national development and continue to play an important role in international and regional affairs. Mexico is a major country in Latin America and an important emerging market economy. China and Mexico are comprehensive strategic partners. China highly values its ties with Mexico. We are willing to work with the Mexican side to enhance mutual trust, deepen cooperation and promote our respective development so as to deliver benefits to our two peoples and inject positive energy into the international community. Q: On June 29, the International Organization for Migration (IOM) elected its next Director General and Portuguese candidate Antonio Vitorino was elected as the new chief of the agency. What is your comment? A: China welcomes the election of Mr. Vitorino, the former Portuguese Vice Prime Minister, as the next Director General of the International Organization for Migration (IOM). With his extensive experience and qualifications, Mr. Vitorino is a worthy candidate for this position. China believes that during the tenure of Mr. Vitorino, he will lead the IOM to make important contributions to the orderly flow of the global population. The Chinese government will continue to support and work cooperatively with the IOM Director General. Q: According to New York Times, more staff associated with the US Embassy in China and the Consulate General in Shanghai have reported similar ailments that occurred to the consular employees in the US Consulate General in Guangzhou. This has aroused concerns in the US. Secretary of State Mike Pompeo also mentioned this when talking with State Councilor and Foreign Minister Wang Yi on the phone last week. Do you have more information or any comment on that? A: State Councilor and Foreign Minister Wang Yi stressed again China's view on this issue during his telephone conversation with US Secretary of State Mike Pompeo. 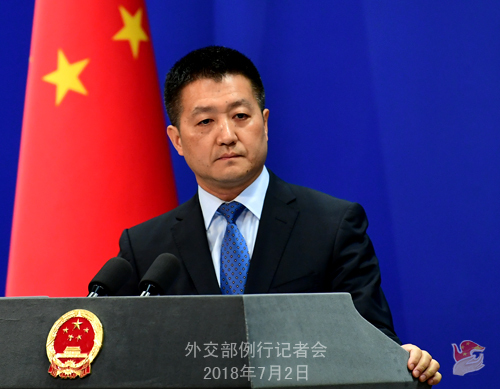 I would like to reiterate that China has committed itself to ensuring the safety of foreign diplomatic and consular staff in China, including those from the US, in accordance with the Vienna Convention on Diplomatic Relations and the Vienna Convention on Consular Relations. 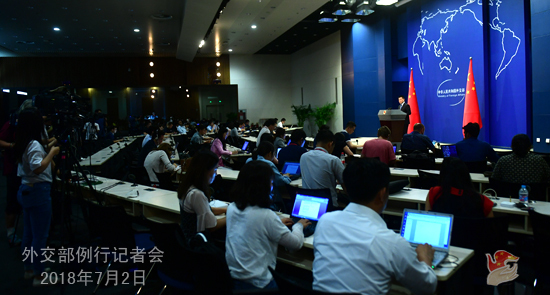 After the US side reported the situation as you mentioned, the relevant Chinese authorities have carried out serious investigation and informed the US side of the result. By far, we have found no cause or clue that would lead to the situation reported by the US side. If the US side has further information or clue to share with us, we are willing to stay in communication with them.